This week's Crafty Tuesday is brought to you by my latest obsession with sewing pouches. I have a serious zipper pouch problem right now. I am sure it will pass just as fast, but for now I am just embracing it. 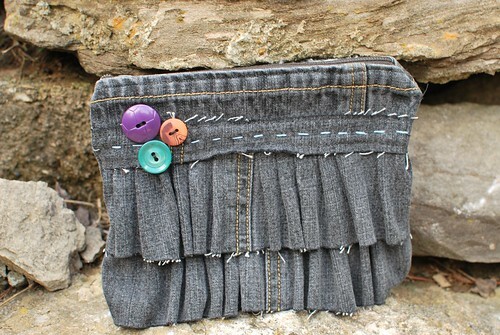 I had this brainstorm for a zipper ruffly pouch made from an old pair of jeans. It did not turn out the way I envisioned it at all. It looks like a little mini skirt. Yikes. Why is it those ideas always seem much better when they are in my head? Since I was not really satisfied with my first pouch, I had to have another go at it. I dug out a vintage pillowcase from my stash. I am realizing I have a bit of a pillowcase fetish, but that is a topic for another day. This time I went with a different sort of ruffle. It turned out ok, but I used a felted wool sweater for the lining to give it some body and it just doesn't feel right. 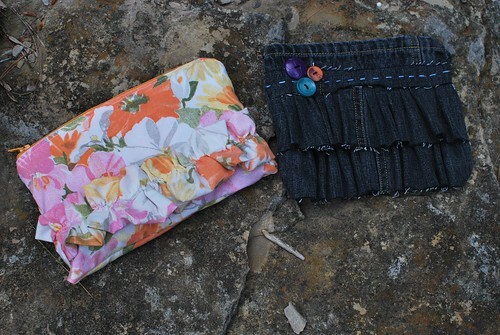 The coloring for the denim purse is off in the photo below, but the pillowcase pouch looks ok. I was too lazy to try to fix it in photoshop. On a more positive note, I actually made myself start knocking out my pending orders. I finished this bib and burp cloth set late last week. Then Mitch was kind enough to take the kids to the park for a long bike ride so I had the house to myself Saturday morning. I was able to get all the coffee sleeves cut out and assembled. I was able to also sew an owl. Now I just need to sit down and applique the sleeves and put the finishing touches on the owl. Oh, and also finish the third pouch that I have cut out. Hopefully this one will turn out better than the first two. Working for an hour every day worked well last week so that is the goal for this week as well. Wish me luck. I think they are both cute, but yes it does look a bit like a denim miniskirt. Still cute! 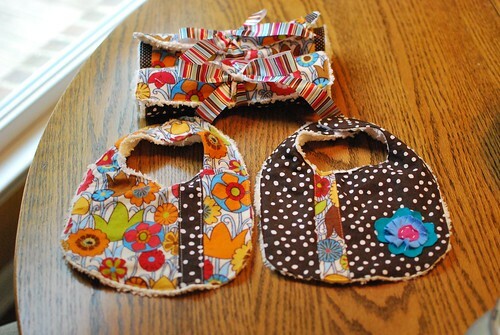 Those bibs are so cute! Great job on them. I think the pouches are adorable! I just finished some burpcloths too...it is baby season again! I love your colors and the bibs, too! I totally skipped CT this week - if you couldn't tell. :-) I'll be back next week!